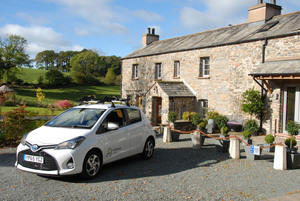 [Updated] Co-wheels is running a special membership offer for guests of The Hyning Estate. The offer means people can join the club for a one-off discounted membership fee of just £5 (normally £25), no monthly fee (normally £5) plus £5 driving credit! Co-wheels has a fleet of Toyota Yaris Hybrid, low-carbon cars, parked near to travel gateways such as Oxenholme station - see the full list of locations in the Lakes. Members can access cars 24 hours a day, 7 days a week with keyless entry to the vehicles, allowing your car hire to fit seamlessly with your connecting travel. A simple hourly and mileage charge covers fuel, tax, maintenance and comprehensive insurance - so all you do is the driving! Cars are parked in designated parking bays and can be booked in advance or last minute either on-line or over the phone. The special offer code "LDTHE" needs to be used in the promotions box on the Co-wheels online application which is reached via the http://www.co-wheels.org.uk/join‘Join’ tab an the top right hand side of their home webpage and after a quick driving licence check online, you'll get your smartcard in the post and can book the cars..
For further information on Green Initiatives at The Hyning Estate, please see this article.